That’s a loaded question. Especially for a home redesigner like the team at Agricola Redesign. It’s a common question we get from clients and others in the industry who are searching for the perfect home design accessories. The design team just returned from AmeicasMart Atlanta, where we spent the week participating in design education conferences and buying items to bring back to A Village Gift Shop and to use in our work with clients. 1. 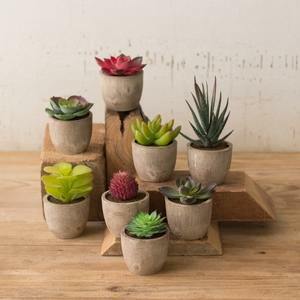 We love using small, artificial succulents on trays, or tucking them away in a bookcase. It not only adds just the right pop of greenery, but it also brings texture into the room. People are starting to step away from silk plants and turning to succulents, which, when clustered together, can be a much bigger design element for a room. Succulents are a great way to add to a design style while also bringing color and texture into your home. 2. Clients love family message centers, and with everyone’s busy lifestyles it seems to be the best way to stay in touch with each other (cell phones aside). When we saw this large message center, we knew we had to have it to bring into clients’ homes. It features colander clips and a chalkboard, so you can leave notes to each other while also creating a fun spot for everyone to stay organized. Family message centers are a great way to keep up with everyone and their busy lifestyles. 3. Don’t drink wine? 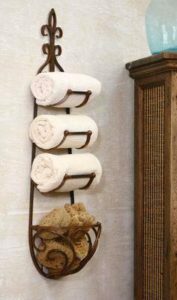 That’s OK, you can still purchase this beautiful wine rack and use it as a towel holder in the bathroom. It’s a way to add extra storage to a space-challenged bathroom while keeping the space unique to your design preference. Wine racks are the perfect item to hang in a space-challenged bathroom to hold your towels and extra sponges. 4. 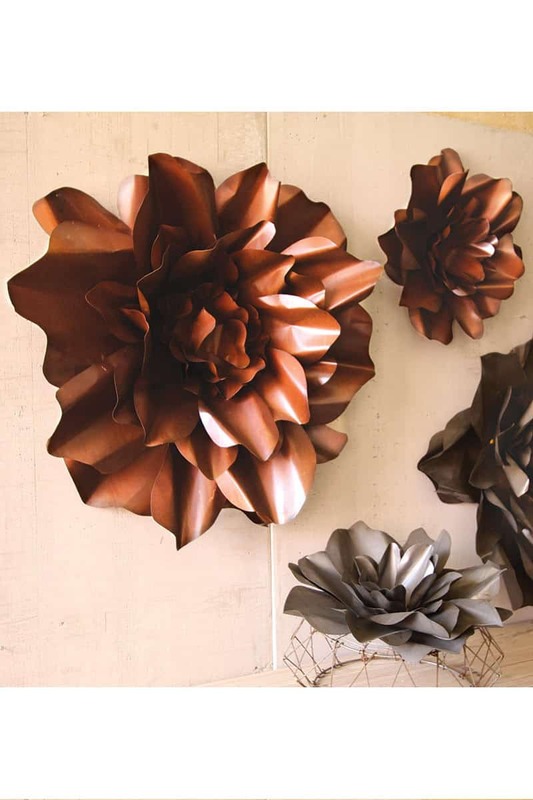 We are obsessing over these large metal flowers that come in both large and small size. They’re perfect to use as wall art, and we’re absolutely loving the way the flowers look on a stone fireplace. The small metal flowers also look great laying flat on a table with a simple candle inside, or on the wall next to the large flower. No matter how you set it up, it’s sure to be a conversation starter at your next gathering. These large metal flowers are perfect for hanging on the wall or even using as a centerpiece on the dining room table. 5. One home design trend you can be sure will never go out of style are candles. You can find Ella B candles at A Village Gift Shop. They even feature a scene for each neighborhood in Cincinnati (and elsewhere). The jars are simple and perfect with a round silver bumble bee tag and are great to fit in with any home decor style. Candles will never go out of style and Ella B candles are the perfect accessory to add to your home.